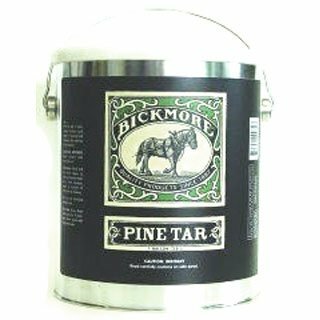 Bickmore Pine Tar for horse hooves is formulated to help keep hooves from cracking, spliting and hard frogs by helping to retain moisture in the hoof and encouraging new growth to hooves more elastic and flexible. Available sizes: Pint, Quart and Gallon. Bickmore Pine Tar for Horse Hooves has different options and/or variations, please choose below. 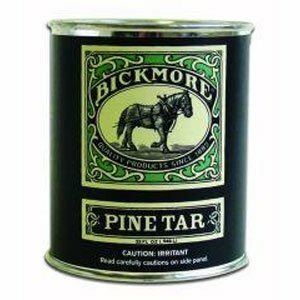 Bickmore Pine Tar for horse hooves is formulated to help keep hooves from cracking, spliting and hard frogs by helping to retain moisture in the hoof and encouraging new growth to hooves more elastic and flexible. This special topical anitseptic helps to fight fungicidal and bacterial infections commonly found in the hooves. Easy to apply, just wash and dry the hoof and place on the hoof was below the coronary band. May also be applied to the bottom of the hoof prior to shoeing as a hoof pack. Available sizes: Pint, Quart and Gallon. Made in the usa100% Pure Pine Tar.